CCTV footage of a biker getting rammed into a van after he’d vandalised a number of cars has been released by police. 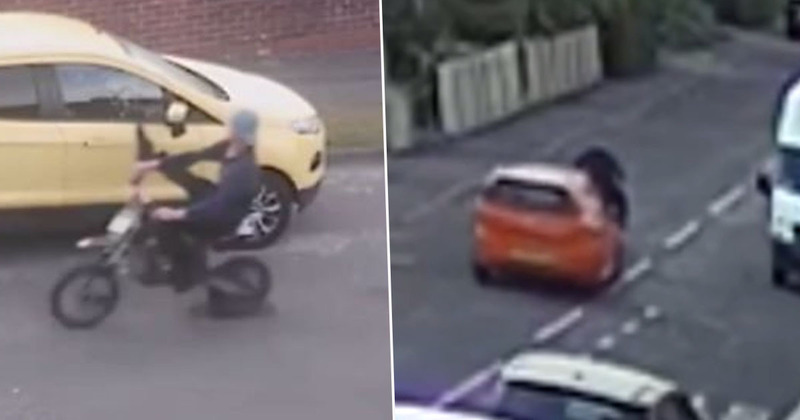 The shocking footage shows the moment Ashley Wood was pursued by an orange Fiat Punto on Victoria Road in Pinxton, Derbyshire, before being rammed off his bike and into a parked van. As a result of the collision, Wood was left lying in the middle of the road unconscious, having sustained serious injuries. In the minutes leading up to the incident which happened on June 15 last year, 29-year-old Wood had embarked on a ‘spree of criminal damage’ and had tried to kick in a number of car wing mirrors while speeding along pavements on a mini motorbike. The 29-year-old was yesterday (April 4) sentenced for the series of offences that took place prior to the incident, with the CCTV footage being released by police in the hope that the driver of the car will be found. The driver of the Fiat Punto drove off immediately after the collision and the car was later found burnt out in a layby. Officers from Derbyshire Constabulary are continuing the investigation in an attempt to identify the driver. Wood, of Talbot Street, Pinxton, was found to be over the drink-drive limit at the time of the crash and was also under the influence of drugs when he raced down streets. After the incident, the 29-year-old had to spend a week in hospital to receive treatment for his injuries and was eventually charged with dangerous driving, driving under the influence of alcohol and drugs, and driving without a license or insurance. Yesterday he pleaded guilty to all charges and was sentenced to eight months in prison – suspended for 18 months – at Nottingham Crown Court. He also received a 12 month driving ban. Ashley Wood decided one morning that he was going to ride around on a mini motorbike, kicking the wing mirrors of cars parked across Pinxton. It’s clear from the CCTV footage that he had no regard for other people’s property, or indeed for other people’s safety. He rides at speed along pavements and, during the course of our investigations, we discovered he was riding under the influence of drink and drugs. The consequences could have been much worse. I’m pleased that he’s now been sentenced for his reckless actions and I hope this sends a clear message that we won’t tolerate behaviour like this on the streets of Derbyshire. 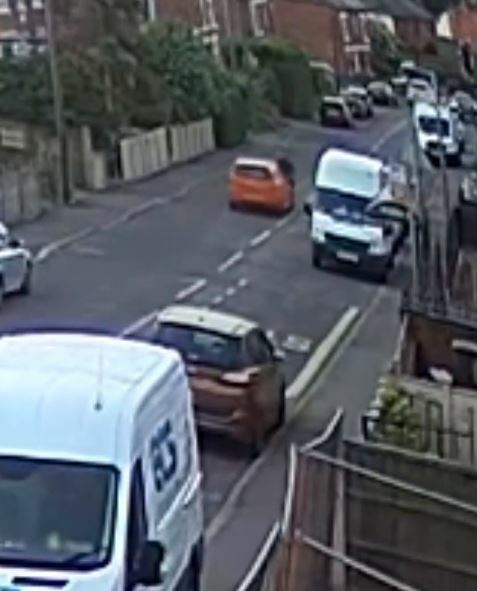 We've released this shocking CCTV footage showing the moment a motorbike rider is rammed into the front of a parked van as part of a renewed appeal for information.The incident, which took place in Victoria Road, Pinxton on the morning of June 15 last year, left the rider – Ashley Wood – lying unconscious in the road with serious injuries.The car, a distinctive bright orange Fiat Punto, drove off and was later found burnt out in a layby.Officers are today issuing the footage as part of an ongoing investigation to try and identify the driver and occupants of the Punto.The appeal comes after Wood was yesterday sentenced for a series of offences that took place in the minutes prior to the collision.During our investigation, we discovered that Wood had himself embarked on a spree of criminal damage – trying to kick car wing mirrors and speeding along pavements.The 29-year-old, of Talbot Street, Pinxton, was over the drink-drive limit at the time and also under the influence of drugs when he raced across the town on his uninsured mini-motorbike.He was captured on CCTV kicking out at wing mirrors or parked cars – and on one clip can be seen to strike the mirror of a Nissan Qashqai.Following a week-long stay in hospital for treatment to his injuries, as a result of the collision with the van, Wood was eventually charged with dangerous driving, driving under the influence of alcohol and drugs, and driving without a licence or insurance.He pleaded guilty to all charges and was sentenced to eight months in prison, suspended for 18 months, at Nottingham Crown Court on Thursday, April 4. He also received a 12-month driving ban.Detective Sergeant Scott Riley, from Derbyshire Constabulary’s Collision Investigation Unit, said: “Ashley Wood decided one morning that he was going to ride around on a mini motorbike, kicking the wing mirrors of cars parked across Pinxton. “It’s clear from the CCTV footage that he had no regard for other people’s property, or indeed for other people’s safety. He rides at speed along pavements and, during the course of our investigations, we discovered he was riding under the influence of drink and drugs.“The consequences could have been much worse. I’m pleased that he’s now been sentenced for his reckless actions and I hope this sends a clear message that we won’t tolerate behaviour like this on the streets of Derbyshire.“However, there is a twist to this story. Shortly after he rode around kicking cars, Ashley Wood was pursued by an orange Fiat Punto.“CCTV shows the car following him along Victoria Road before ramming him head-on into a parked van.“The Punto was driven off, leaving Ashley at the scene with a number of extremely serious, but thankfully not life-threatening, injuries. “We believe that this was a deliberate act, but we still do not know who was driving the Punto. “Our investigation into that incident is still ongoing and I urge anyone who has information on the person or people responsible to ring us.”If you have any information which may assist with our enquiries, please get in touch using one of the following non-emergency contact methods. Please quote the reference number 18000276164 in any correspondence.• Facebook – send us a private message to this page• Twitter – direct message our contact centre on @DerPolContact • Website – complete the online contact form www.derbyshire.police.uk/Contact-Us.• Phone – call us on 101.You can also call Crimestoppers anonymously on 0800 555 111.Please note in the event of an emergency you should always call 999. However, police are also investigating what happened afterwards and are appealing to the public to come forward with any information they may have about the driver of the Fiat. The Punto was driven off, leaving Ashley at the scene with a number of extremely serious, but thankfully not life-threatening, injuries. We believe that this was a deliberate act, but we still do not know who was driving the Punto. Our investigation into that incident is still ongoing and I urge anyone who has information on the person or people responsible to ring us. Anyone with any information is asked to get in touch by calling 101 and quoting the reference number 18000276164.